Filling an empty wall can be a challenge, but inspiration struck a Peninsula artist when she stumbled upon an online call to honor a female trailblazer every day in January. 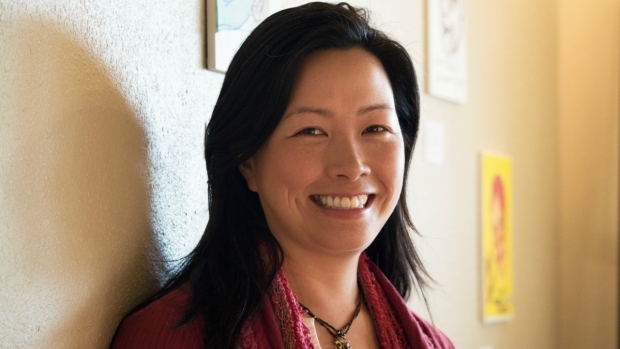 "I knew I had this show and I had to do about 25 pieces, which is more than I’ve ever had to do," said Lisa Chu, whose work is exhibited as part of an artist-in-residence program at Bamboo Hair and Body in Half Moon Bay. "I was really just percolating in my mind for inspiration and surfing on Instagram and saw this thing called the 'Badass Women Challenge.'" The artists, Sarah Pearson and Sam Zabell, specialize in hand-lettering and calligraphy, and urged their followers to tip their hats at pioneering actresses, politicians, writers, activists, and more. The list includes Gloria Steinem, JK Rowling, Malala Yousafzai, Rosa Parks, Michelle Obama, Jane Austen and Shonda Rhimes. "As soon as I saw the list, I said, 'That’s it! I’m going to draw portraits of these women, one a day, every day, during the month of January,'" Chu recalled. An added challenge: she has never drawn faces before. Guess who's back, baby!? It's the #badasswomenchallenge, just in time for the new year! 🎉 I've also asked the super awesome @samzawrites to help me co-host because she is totally like-minded and talented and JUST. SO. GREAT. ❤️ So, January 1st, it's time to bust out the brush pens, paintbrushes, pencils, iPads, scissors, bullet journals, crayons, typewriters, or ANYTHING else you create with -- and let these women inspire you! Post your work with #badasswomenchallenge every day (or whenever you feel like jumping in), for a chance to be featured! Repost this image if you're participating so it's in your feed, and to help spread the word! Let's do this! 👊 P.S. If you've been with me awhile, you might notice some repeats, but I wanted to start back up strong with some of the most badass women we've done so far! Chu, who is admittedly still learning the strokes of her brush, said she also knew that she was embarking on a history lesson. "What I noticed is that before the project started, probably half of these people I knew very little to nothing about, so I knew I had to go do research," she said of women she learned along the way were "bold" and "daring." While familiar with some of the humanitarians, she said she needed to brush up on some current female role models, including Emma Watson. "I had to get to know her, I didn’t know who she was!" Chu said. "I didn’t know who Emma Watson was!" Chu started and completed one piece on each day of the challenge. "I was just experimenting and throwing a bunch of ink on the page," Chu recounted. "I was surprised by what I considered just a really quick sketch or something to get myself to be less afraid of doing something, can end up having resonance with people." Chu's work will appear through May at Hair and Body, where four local artists are invited each year to sell their artwork. Chu will also be hosting a workshop on painting "Bold, Audacious, Daring Women Portraits" on Sunday. "I’m asking people to choose a 'badass' woman that inspires them," Chu said. "Bring an image and maybe a sentence that you know about them and we’ll use that to inspire our painting." Chu surprised herself by participating in the month-long challenge, but the experience taught her how to be a little more "badass" herself, she said. "I wasn’t someone that grew up drawing or painting or ever thinking I could do it," Chu said. "I’ve always found that some kind of a daily challenge, to make something every day, I always grow."